I just returned from what has become my tri-annual trip to Swan Lake. With hours of delay, I had plenty of time to enjoy the airport experience. One would think after all these years of traveling I’d have the whole process down pat. I wear shoes that slide off, have my quart-size plastic bag with liquids (no more than 4 ounces!) easily accessible, have nothing in my pockets, my ticket in one hand and my I.D in the other. And yet, each visit to the airport is educational. 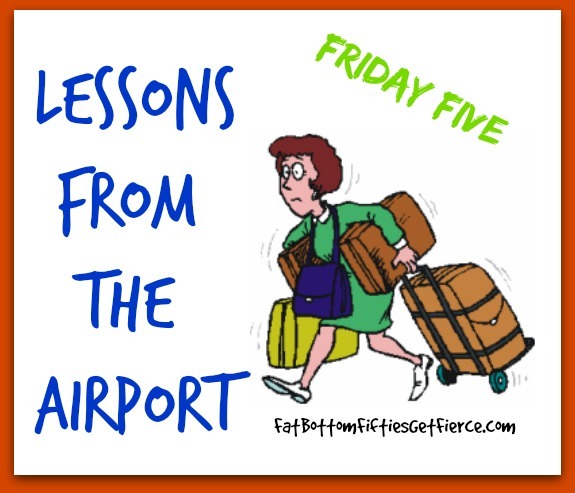 Here are five lessons I learned during my airport time on this trip. 1. The special alerts you receive on your phone are not necessarily reflected on the Departure Boards. After receiving two such alerts indicating my plane was going to be an hour and a half late departing, I left the house thirty minutes later than I had originally planned. Which still would get me there plenty early. So imagine my horror when I casually stroll in the airport and note on the Departure Board that my flight has a proud “ON TIME” next to the original departure time. Which was only six minutes away. I learned a couple more lessons before I picked up on the one about the board not reflecting the most current flight info. 2. If you only have underwire left on one side of your bra, you become a suspect. Two strips of metal under your breasts and you have good support. Apparently just one metal strip leads to the assumption you may have a concealed weapon in addition to being lopsided. 3. Freaking out and demanding that the security agent “Feel me faster” actually speeds up the process. I don’t think that is the usual response they get. Whether I had taken the fun out of the event or the agent was responding sympathetically I don’t know. What I do know is she abruptly stopped the search and told me to “just go.” Please keep in mind that I was quite sure my plane was already rolling down the runway – I think they can sense sincerity. 4. Your slip-off shoes should also be running shoes. Because if you are late, your plane will be at the terminal farthest away. Guaranteed. This is also true if you only think you are late. During my long, less-than-gazelle-like run, I had visions of running out to the runway screaming for the plane to stop. Imagine my surprise when my winded self arrived at a full terminal of lounging passengers. Fortunately I didn’t have enough breath in me to utter the words that first popped into my head when it was confirmed that the flight was indeed going to be delayed two more hours. 5. Bonding with fellow passengers is not always a two-way event. There was a lovely family of four seated directly across from me in the waiting area. The little boy was loaded with questions and each received a patient, informative response from his father. I got to know a lot about them in a half hour. In our kill-some-time wanderings, I passed the toddler and his dad twice in airport shops. When I encountered them a third time at a snack counter, I gave the dad a big smile and said hello. What I got back was a blank face as he scooted his child a little faster than necessary in the opposite direction. OK – so maybe it wasn’t so much a shared experience as it was eavesdropping. Lesson learned. What’s YOUR most memorable airport lesson?